STEM was first coined as an educational term by the National Science Foundation in early 2000. It stands for Science, Technology, Engineering and Mathematics and represents an interdisciplinary approach to teaching these four subjects. I would like to tackle some of the most common questions regarding this new approach to math and science education. Q: Is STEM just another educational fad? The growing emphasis on STEM education is not a fad. According to STEM Education, Science Literacy and the Innovation Workforce in America: 2012 Analysis and Insights from the Bayer Facts of Science Education Surveys, it reflects the changing needs of the American job market. STEM careers are the second-fastest growing occupations in the nation, just behind healthcare. Although the demand for employees in the fields of science and engineering is growing, if current educational trends continue, America will only be able to fill 70% of STEM jobs in the future. This discrepancy has motivated many STEM-related companies to strongly support STEM in schools. They want today’s students to be tomorrow’s qualified employees. While American STEM careers are a big piece of the puzzle, STEM education also benefits students who may not choose to go into a career in the field. As our lives become increasingly reliant on technology, STEM literacy benefits us all. It also helps us face the collective challenges related to energy, climate change, and disease. Q: Are today’s teachers prepared to teach STEM? The short answer is no. According to the Bayer study, not enough teachers are confident in their abilities to teach Science, let alone Science in an interdisciplinary approach with Tech, Engineering and Math. This is where fads come in. 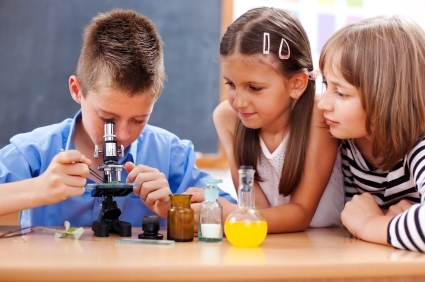 Many people claim to have quick fixes for integrating STEM programs in our classrooms. Be skeptical of any such offers. Achieving effective STEM education will take time and effort, but there are plenty of resources out there that can help. Because corporations are invested in seeing STEM education improve, a considerable amount of money is going into resource efforts. One place to start looking for resources that will help you develop a STEM program is your local district or community. Q: What are some recommended resources for STEM programming? 1. I-STEM Education Initiative - An initiative from the University of Illinois that works with developing P-12, undergraduate and graduate STEM education, as well as STEM policy. 2. 100K in 10 - A partnership dedicated to promoting STEM education by training qualified teachers who will promote these skills in America’s classrooms. 3. National Math and Science Initiative - A resource which provides professional training to teachers in STEM fields and encourages more high school students to take college-level math and science classes. 4. PBS Teachers - A site full of classroom-ready digital resources to help teachers enhance and develop their STEM programming. 5. Invent to Learn by Sylvia Libow Martinez and Gary Stager - A book which encourages educators to help their students harness natural curiosity by breaking down the artificial barriers between arts and sciences. 6. Creating Innovators: The Making of Young People Who Will Change the World by Tony Wagner and Robert Compton - A book which profiles young innovators and encourages teachers to promote innovation in their students. Improving STEM education is a win-win for all!